Disclosure: I do not claim to be clairvoyant. I’m fully aware of the fact that I could just as easily be wrong about any prognostications forthwith. I also know you are tired of me disclaiming this over and over but I don’t want anybody to get the wrong idea that I think I’m some kind of market shaman. These are just my interpretations. They can be profitable or at the very least entertaining. 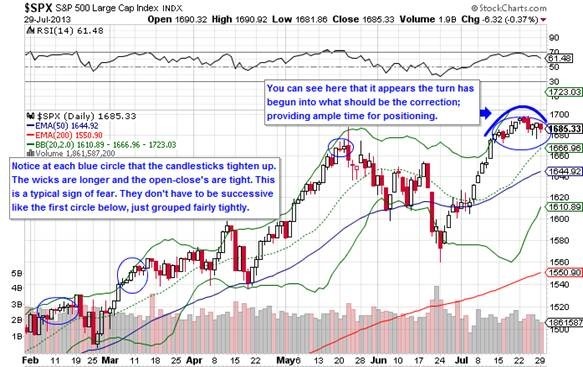 In particular, the charts of the stock indexes are painting a picture of that correction I mentioned in the previous note I sent about “market timing.” In that note, I had stated what I thought were two probable outcomes for the stock markets. Specifically, I said, “…for the stock markets we could see a bounce back to new highs from here and then a stronger, scarier takedown somewhere in the late-July through mid-September range. It’s more probable that we chop along moving sideways through the Summer with some up and down bouncing and then finish out the year strong as animal spirits recover and taper talk dies down with renewed vigor behind the rhetoric of quantitative easing.” It appears as if scenario 1 may be the play, but still with a strong finish to the markets for the year. I see this potential move playing out similar to the Summer of 2011. In February of 2011, the S&P 500 had a nice little 7% correction just to whet all the speculators’ whistles and then…BAM! May came along with the fear already established from the 7% correction and the worries of the 1 year anniversary of the infamous “Flash Crash,” and so began a 3 month-long 20% correction. You can observe the action on the Weekly chart below. The Daily chart below it seems to be showing the beginning of the current potential down-move. Monday’s action is not a good sign either and is supportive of the call for a corrective move. As I mentioned in the “market timing” note, this correction(if it occurs) will not be the big one. Articles will be published on the worldwide-interconnected-net about long-term resistance at the highs of 2000, 2007, and now 2013 but this down-move shouldn’t be of the same magnitude as the previous 2 biggies. The true big one, which feels like 2 or 3 years away, will probably be a combination of a bank’s default due to excessive leverage in their derivatives position and a country’s outright default on its debts. Beware of Italy. These actions will initiate a waterfall of negative effects amongst the large financial entities as nobody knows who owes who and who has what collateral for all the intermixing of credit transactions. I spent enough time on that in the previous note on derivatives. This correction will present an opportunity to profit on the way down for the alert trader or at the very least provide some quality entry points at the bottom for the more conservative, before a potential year-end rally. I would look for a move between 10% and 15% off of the high of 1,700ish. A 10% move down would take the S&P to the bottom of the Bollinger and the 50-day EMA on the Weekly chart. It would take a 20% correction to get the index down to the 200-day EMA. A move of that magnitude just doesn’t feel right, especially if the bulk of this move occurs in August and finishes out in the beginning of September. There are multiple ways to play a correction. For the non-tape-reading speculators or un-fool-hardy timers, I won’t bore you with details. Some easy suggestions though would be: Calls on the VIX equivalent ETF, Puts on the S&P 500 equivalent ETF, Puts on TM as the Nikkei should move down in conjunction, or short the sector leaders(with Puts) but specifically Consumer Discretionary as I think it’s time has come for a real breather. Bear in mind that trying to front run a leader sector is not the brightest move. These are just un-vetted potential plays being thrown out. Interestingly, I have some additional charts from SentimenTrader to support a corrective move but the strength of the correlation of these charts to the S&P 500 is admittedly dubious. This first sentiment chart only goes back 7 years, which to a statistician makes the sample size virtually unusable. Fortunately, I am not a statistician. 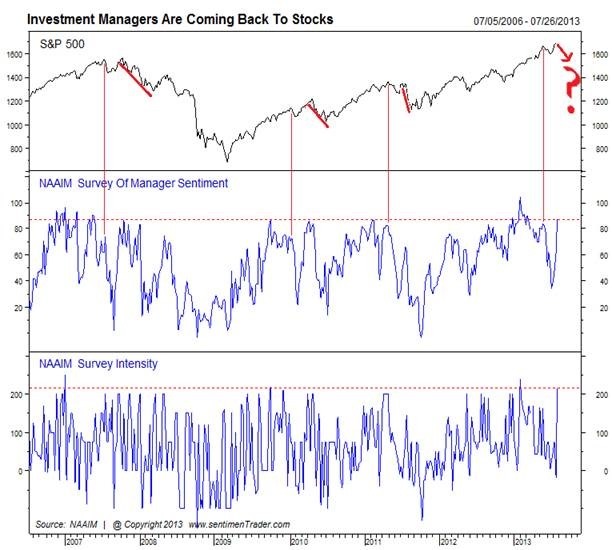 I’m a speculator and the chart is a sentiment reading of the members of the NAAIM, which is the National Association of Active Investment Managers. These members include billion dollar mutual fund companies and large-scale financial advisors. The chart is intriguing because over the last 7 years, each time there has been a correction in the S&P 500 with at least a 45 point move down in sentiment followed by a V-shaped correction in the sentiment then there has always been an even larger correction in the S&P 500 shortly thereafter. This is denoted by the red lines. 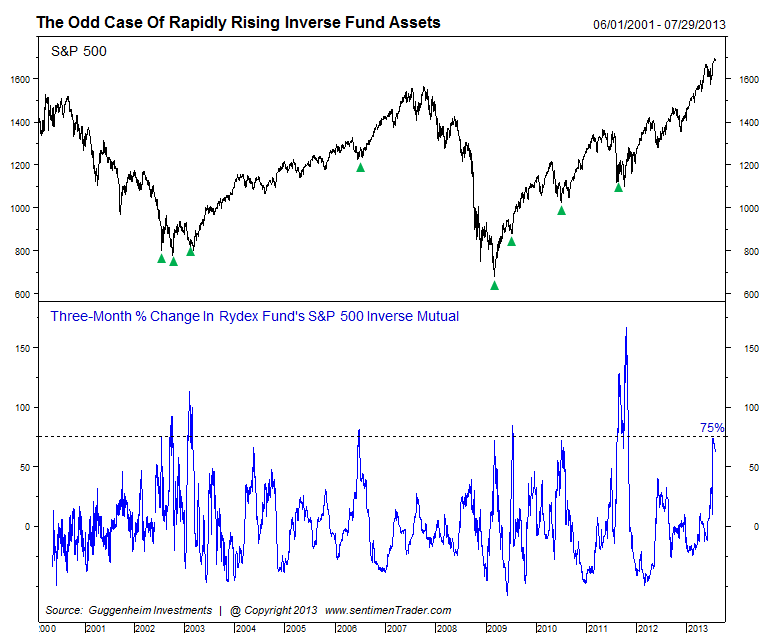 The second quirky chart is of the Rydex Inverse funds and asset inflows. It’s a contrarian chart, so over the last 11 years every time the 3-month change in asset inflows to the inverse funds moved by 75%; a rally took place. This is because usually the retail speculator or unskilled advisor will use these funds thinking they’re smart and standing apart from the herd. They are almost always wrong, as denoted by the green arrows. What is peculiar though is that this almost always happens after a substantial decline, per SentimentTrader, and the most recent read that hit the 75% change mark was after that little 7.5% move back in May and June. I think that may be due to higher-skilled traders positioning this time ahead of the potential corrective move in the S&P 500. 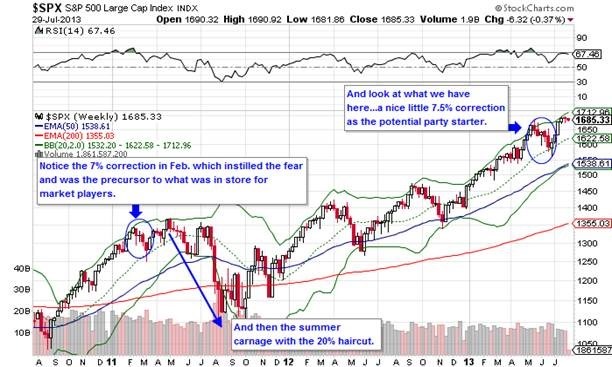 The indicator is usually a contrarian sure thing but it doesn’t smell right this time. And if you like to trade in any capacity, I would strongly recommend a subscription to SentimenTrader. It provides access to a wealth of indicators that have proven valuable to me time and again. I’m not plugging because they kick me back anything. I’m positive they don’t even know this blog exists. I’m just a satisfied subscriber. Obviously, you know there is no love lost between me and the “elite” banks. 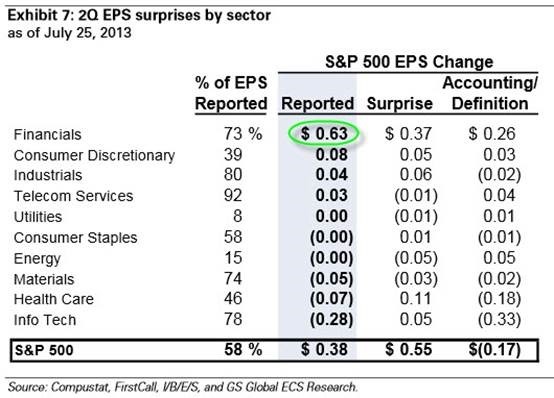 The problem is that when Financials are carrying the day for earnings, trouble has a habit of following. For true strength, we need the sectors underlying actual economic growth to be leading; not the damn derivative rolling, reserve releasing banks. I find this information to be supportive of the evidence relayed above. As usual, I’d like to leave you with one last chart to provide some final support behind the thesis. 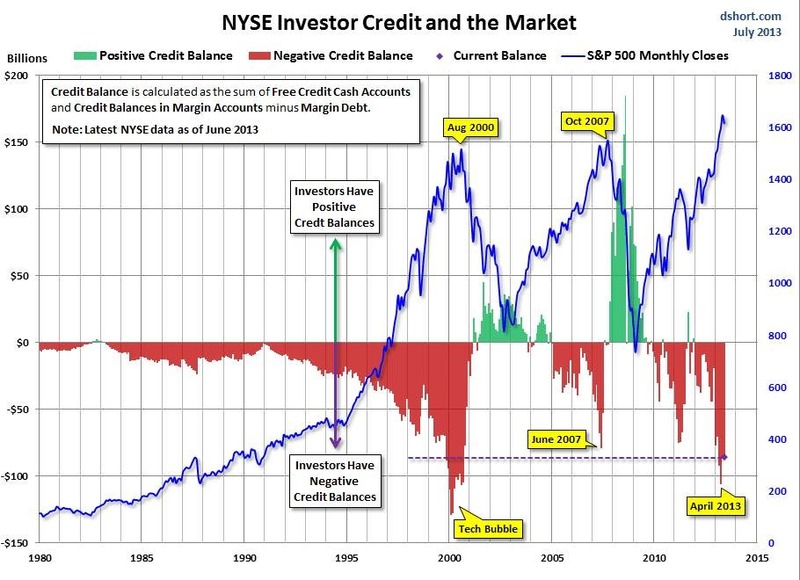 This chart illustrates margin debt(aka investor credit) levels on the NYSE and the correlation to S&P 500 performance. 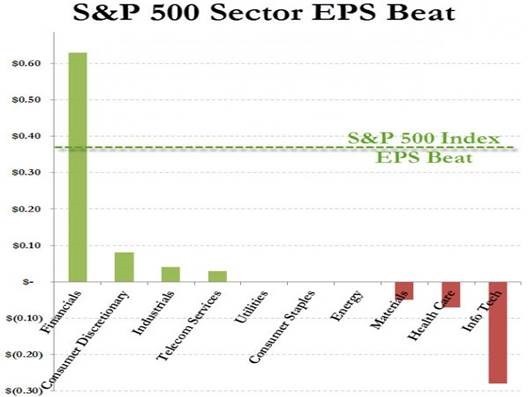 This chart is courtesy of Doug Short. What you’re looking for here is that once margin debt levels peak very close to or past the purple dotted line, then the margin levels begin to taper leading to a correction. This chart creates the perception that a big correction, similar to 2000 or 2007, is on the way and maybe even imminent. Again, I firmly do not believe that is the case. I will reiterate that I think we’re looking at a 10% to 15% correction with the potential to go as high as the low 20%’s for the total corrective move. This correction has the potential to fall right in line with a rise in gasoline prices if the last note I sent regarding oil prices accurately described a petrol spike. It appears that oil is leveling before a reversion to normalized price levels, but we’ll have to wait and see. If this note proves to be correct I hope that you’re able to take advantage of the data in your own specific way, whether that’s speculating, bottom buying an equity, or raising cash on a name you were ready to liquidate but were unsure of the timing.